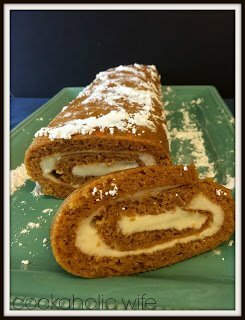 Rolled cakes are one of the harder cakes to make because it requires very careful rolling techniques and the mercy of the parchment paper and kitchen towel you use, but I absolutely love how they look and can’t stop myself from making them. Although, I can’t seem to get perfectly round circles and instead end up with more of an oval shaped cake. I’m sure no one minds though! 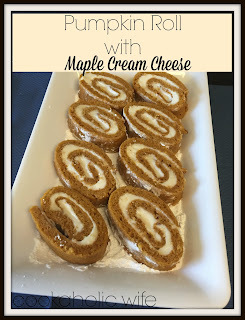 The pumpkin roll is made even sweeter by adding maple syrup to the cream cheese filling. 1.Preheat the oven to 375 degrees. Line a jelly roll pan (15 x 10 x 1) with parchment paper. Grease and flour the paper, set aside. 2. In a medium bowl, combine the flour, baking soda, baking powder, cloves, cinnamon and salt. 3. In the bowl of a stand mixer, combine the eggs and sugar and beat together with the blade attachment on medium speed until pale yellow, about 3-5 minutes. 4. Add the pumpkin and mix until combined, then reduce the speed to low and slowly add in the flour mixture until the batter forms. 5. Pour the batter over the prepared baking sheet and spread to the edges in an even layer. Tap the pan on the counter a few times to remove any air bubbles that may be within the batter. 6. Bake for 11-14 minutes or until cake springs back when pressed gently in the center. 7. While the cake is cooking, sprinkle a clean kitchen towel with powdered sugar. When the cake is cooked through, remove it from the oven and invert it over the powdered sugar covered kitchen towel. 8. Carefully peel back the parchment paper and starting with a long end, gently roll up the cake within the towel. Allow to cool while you prepare the filling. 9. In the bowl of your stand mixer, beat together the cream cheese, butter and powdered sugar until smooth. Add the heavy cream and maple syrup and beat on high until light and fluffy, about 2 minutes. 10. Carefully unroll the cake and remove the towel. 11. Spread the cream cheese mixture over the cake. Roll the cake back up and wrap in plastic wrap. 12. Refrigerate for at least 1 hour. 13. Sprinkle powdered sugar over the cake, slice and serve. This recipe needs to be refrigerated for 1 hour before serving. The cake is light and full of pumpkin flavor that just goes so nicely with the sweetened maple cream cheese!